Meet Katie W - Katie W lives in a large Mennonite farmhouse, but is busy with the building of a smaller Daudi haus on the farm so her son and his family can live in the large Mennonite home and work the farm with Katie's husband. They have switched their farm from dairy farming to being a crop farmer, and she sells her brown eggs and produce at the local Farmers Market. As a side note: Katie makes the very best frozen corn - which I buy in bulk - it tastes just like the corn just came off the cob, delicious! 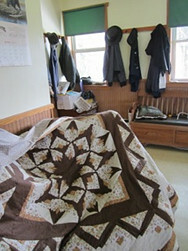 Katie is an absolute wonder with the quilt tops she sews for us. She can make a pallet of colorful scraps into stunning quilts that are sure to be treasured and loved. 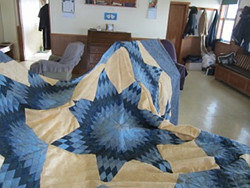 Katie will also quilt for us very large quilts (up to 125 inches square) in the quilting frame that her husband has made and enlarged for her. We can never get a photo of Katie, not even her arm! She takes the 'no photo' ruling very seriously. 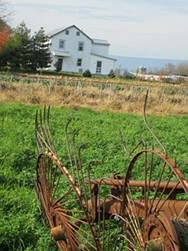 Katie W is Old Order Mennonite which means like the Amish she gets around in her Horse and Buggy, doesn't ride bicycles, doesn't get her picture taken and works from sun rise to sun set. 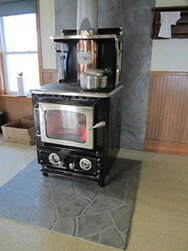 I have included photos of her farm house, some quilt tops she has made and her beautiful cook & heating stove.